A screen shot is a picture of what is displayed on your computer monitor screen. It's often desirable to capture what you see on your monitor for future reference, or to share it with other people. Microsoft Windows provides a built in way to capture the screen using the PrtSc key on the standard keyboard. There are many third party software applications that will do the same thing, but this article will focus on how to do it natively in Windows 7. The process is essentially the same in Windows 10. The only difference may be in locating the Microsoft Paint application. Set up the screen to show what you want to capture. Press the PrtScr key to place the information into your computer's clipboard (temporary memory). Transfer the clipboard content to an image editing program; Paint in the case of Windows. Edit the image as necessary. Save the image in the preferred format. JPEG is good enough for most purposes. SET UP the screen display. Simply arrange things the way you want to preserve them in a screen shot. NOTE: Keyboards vary in layout, but the most common arrangement is show in the above photograph. Pressing the PrtScr key will capture whatever is on your entire monitor screen at the moment. This can be a bit deceptive because you will get no feedback that something has happened. Once the key is pressed, the screen shot is sent to a temporary memory location known as your clipboard. TRANSFER THE CLIPBOARD CONTENT to Windows Paint, or any image handling program you have installed. NOTE: the location of Paint may vary, but it is pre-installed with all modern versions of Windows. It's simply a matter of locating it and starting up the program. SET UP the window. Simply arrange things the way you want to preserve them in a screen shot of the window. PRESS Alt+PrtScr keys both at the same time. 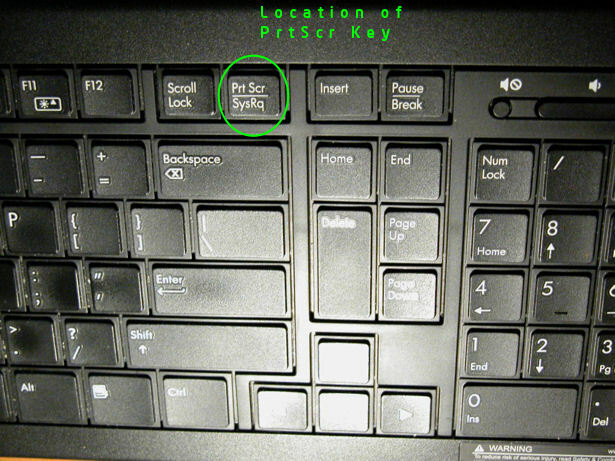 Refer to the above photograph for the typical location of the PrtScr key. Pressing the Alt+PrtScrn keys will capture only the content of the window that is in focus. This can be a bit deceptive because you will get no feedback that something has happened. Once the keys are pressed, however, the image is sent to a temporary memory location known as your clipboard.